We are bombarded every single day by information that can heighten our perception of threat towards pain and injury making us vulnerable and vigilant when exposed to related contextual experiences or information. Pain is a motivator to take action, which can be from a range of possible actions including “ignore it”, “chill for a bit”, “stop doing that”, “take your foot off my toe” through to seeing a health professional. 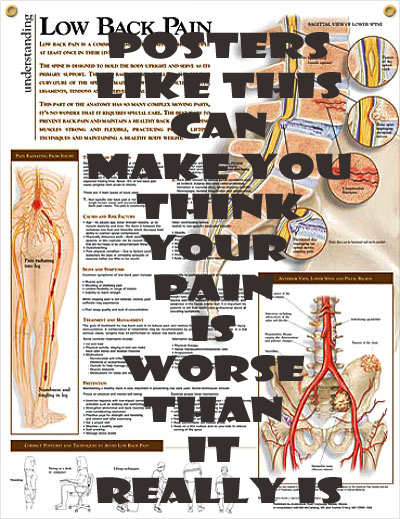 Recent evidence suggests that although pain motivates us to take action it is more how much pain interferes with life. Thus it is disability that is a strong motivator for seeking help (reference). More interestingly are the factors that can perpetuate pain intensity. One such factor is information we are bombarded with on a daily basis in many expressive ways that can heighten our perception of pain thus increasing disability (reference, reference). We are told why, what and how we should look after ourselves when we have pain or sustained an injury by medical/health professionals, colleagues, peers, family, the television, media and in the same context we are given information that can perpetuate our pain experience. Bit of an oxymoron that isn’t it? We constantly scrutinise the information and the world around us so that we can make appropriate decisions on what is best for our survival and procreation. This post gives you a small glimpse of why what we might read, see, hear or feel influences our perception and pain experiences. Watch the video of Stewie from family guy and try to identify what aspects of the clip might influence an increase in threat levels thus potentially being pertinent towards producing pain. What did you manage to identify? Let’s see if you got them all. 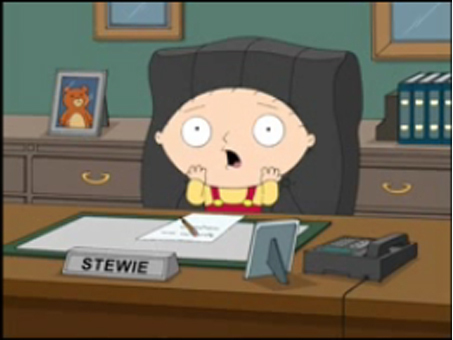 Interestingly the deep voice explained at one point that it was the parasite that was the cause of Stewie’s pain not the functional tasks. Stewie’s chronic pain experiences were highlighted as nociceptive in origin and yet we know that nociception is neither necessary nor sufficient for pain. Persistent pain can be of non-tissue origin. As you can see there is quite a lot in there and there is probably a lot more to pick up on. So why does all this happen? Louis Gifford’s Mature Organism Model explains a humans innate ability to scrutinise the world around us thus providing a decision-making process to determine our best course of action in order to survive. As we develop through infant/childhood we learn and develop a sense of understanding from the world around us influenced by our parents, education, people we admire, experiences etc. This allows us to develop memories, beliefs and behaviours towards those experiences and explains how they can be a contributing factor towards persistent pain states (reference). As we learn and develop we are constantly exposed to information and experiences that mould our understanding (beliefs) and influences our decision-making (behavior). So when we experience pain we scrutinise the contextual perception of information and a cascade of specific interactions of our body systems occur which causes us to take action. Once experienced we learn to recognise signals of impending pain (reference). In the context of things we see, feel and hear will inherently determine an outcome, in this case pain. There are lots of examples that will influence our beliefs and behavior have a look at my previous blog on ‘pain: what’s in a word’ here for further information. Images like the ones below are abundant. They are available to view on health information websites or in health information booklets, or you may see them displayed in clinics such as your GP or health professionals. Whilst you sit in the GP clinic with a sore knee or back you may be tempted to read them or look at the pictures in order to understand more about what is going on. 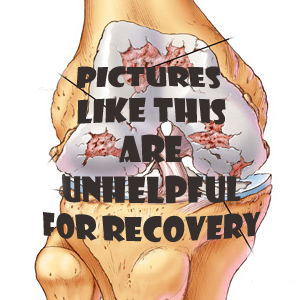 Unfortunately these images often inflate what is understood as a “disease” process. So what can we do about these often disturbing images and messages that we read, hear, listen to? Do we ignore them? Well is it such that if we are always concerned about pain, images will reinforce our worry or anxiety. Pain is a motivator to make us take action. Images, messages and hearsay can perpetuate our behavior and beliefs. It would be more helpful to have information on posters that would provide solutions to appropriately managing injury and pain. Zero pain is not the goal (reference). A shift in focus towards learning to live well with pain is. In the very rare cases (about 2 – 5%) where something more sinister may present it is necessary for your health professional to refer you on. In the remaining majority of cases health professionals should educate and reassure patients that nothing sinister is a cause of their pain, this can be reinforced by appropriate images, educational tools, reassuring advice and even within the media. It is important that when speaking to a health professional that they understand the mechanisms of persistent pain and that they are mindful of what information they are giving you. Obtaining a case history, using reasoning skills to provide education, advice and (from a musculoskeletal sense) ways of learning to explore and confront movement that may have previously been avoided. There are some clinicians out there that feel certain treatment approaches should not be used. Yet I would argue that if we are educating people how to learn to live well with pain that the use of a heat pack, massage, or perhaps some manual technique may be what supports the person whilst they ride out the storm (flare up).